Apart from you, and maybe 100 other people, who actually know what this means, or even cares? I can wholly see why someone in Venezuela or China would want to use bitcoin to "stache" (pun intended) their wealth in a safer place, but I doubt any of them would understand, or have even the slightest appreciation for any merits (if any exist) for what you just said. You don't seem to be giving humans that much credit. I'm pretty sure if you asked someone what a URL was back in the early days of the internet, you'd probably get a lot of blank stares as well. That pretty much makes my point. Bitcoin is a newborn babe, still wailing away in the infirmary, as compared to URLs and the internet. That pretty much makes my point. Bitcoin is a newborn babe, still wailing away in the hospital, as compared to URLs and the internet. If your point was that bitcoin is a newborn babe, in response to what in regard to my post does that argument apply? I'm sure it was just an oversight that you "accidentally" edited out your comment that I replied to, so I'll help you out there; just 'cause I'm a good guy at heart. Hint: look for the bold text I've added to your comment. Therein lies the answer to your latest question. No need to thank me. I'll just consider this my good deed for the day. I'm sure it was just an oversight that you neglected to include your comment that I replied to, so I'll help you out there; just 'cause I'm a good guy at heart. Hint: look for the bold text I've added to your comment. Therein lies the answer to your latest question. Debating you is painful sometimes, lol. I'll argue the opposite of that. As I said, there are already plenty of other crypto-currencies and payment systems out there that can be used for buying cups of coffee. This misunderstands the value that the Bitcoin proof-of-work network provides. No other currency has found a way to provide the decentralized security and censorship resistance that the Bitcoin network can provide while at the same time being able to scale to meet the global demand that a POS system requires. Apart from you, and maybe 100 other people, who actually knows what this means, or even cares? To which I responded with the URL comment. So again, where in my original response (Reply #384) does bitcoin being a "newborn babe" apply? I didn't even know we were debating something. I merely expressed (and then unsuccessfully attempted to explain) the point of an opinion. However, if you regard this a debate, then I will rest my case on statements I've already made, and formally withdraw, with the undisputed understanding that my opinion was not understood by you. Giving you the benefit of the doubt, I will naturally assume that you wouldn't have agreed with my opinion, even if you had understood it. It may be too late to get into bitcoin investing, but it's never too late to get into baseball card investing. I have a Ken Griffey Jr. rookie card that I'm willing to part with. Cheap. Sorry dude, the baseball card bubble ended years ago. Also, bitcoin core is less secure than bitcoin cash. The segwit change to signature validation added an additional point of risk. I choose all 3 and a proof-of-stake crypto. I certainly agree that there are some valid criticisms against the lightning network (ie, channel monitoring), but make no mistake it is a legitimate scaling solution that can handle thousands, if not millions, of transactions/sec with out requiring proof-of-work being it. I watched the video that you posted regarding the lightning network and there were a lot of myths spouted about the lightning network in it and bitcoin in general (stealing bitcoins, centralization, Satoshi's vision>Gavin, etc). The Lightning Network has been successfully tested (on mainnet) amongst several clients for compatibility and therefore the link you posted with regards to the development stage it is in is pointless and doesn't really make an effort to critique the network on any merit. Please explain to me (technically) how bitcoin core is less secure than bitcoin cash? SegWit resolved transaction malleability which was a legitimate security concern. By having the transaction idenifier no longer take into account the signature, an attack who modifies the signature cannot also modify the transaction identifier. Just blindly saying that SegWit is an additional point of risk without explaining that point of risk is a faulty argument against it. On top of that, Bitcoin's network is much more decentralized compared to Bcash, both by hash rate and by node count/location. Considering the fact that a vast majority of bcash's hashrate is controlled by a single entity, it is an extremely centralized currency. Its nodes are also much more centralized when compared to Bitcoin cores. This decentralization across all aspects is what provides the censorship resistance that is required of a proof-of-work network. Finally, how would it ever be possible to scale, on-chain, a proof-of-work system that can process millions of transactions per second. Give the fact that 1MB blocks can process about 6 transactions per second, in order to process transactions on the order of millions of transactions per second, that'd require blocks on the order of terabytes in size. There is simply no way you can propogate blocks of that size and have them reach all the necessary nodes around the world every 10 minutes. It isn't possible. Secondary solutions are required, whether it is atomic swaps with non-proof-of-work currencies (which Bcash can't do because it doesn't have SegWit) or something like the Lightning Network. AND that some of them (which may or may not be extant today) will be someday useful for making transactions. This is an undervalued point. There are already today crytocurrencies that are better than Bitcoins for any particular use-case. You can transfer value worldwide for cheaper and faster with any of them. So then what is Bitcoin's long-term valuation? Nothing. The only thing driving the prices and continued use is speculation and momentum. There will come a day when bitcoin transactions are too slow or too expensive or too hard compared to something else, and everyone will jump ship to the other thing. And then the same thing will happen to that and they'll jump ship to the next thing. I'm sure that there are some long-term use-cases that will make cryptocurrencies stick around. But the long-term value of any particular cryptocurrency will always be zero, and people who jump in to the middle of a price spike will loose their shirts when the bubble pops. Cryptocurrencies and Blockchain as a *technology* I think has some staying power. Any individual implementation is transient. One could argue that this is now a historical fact, rather than mere speculation about the future. Since this guy, AKA Roger Ver, reportedly turned $25K into $244 million buying into bitcoin at a dollar, I would dare say that he speaks from a pretty strong position of authority, and he seems to agree with your points, exactly as you stated them. I have noticed that lifeanon suddenly "magically" becomes extremely active about some other topic whenever this point is raised. Funny that. It's almost like he's merely a troll who has a vested interest in Bitcoin (specifically) being successful for as long as possible. The problem I have when people try to line up bitcoin's price rise in comparison to other past historical bubble is that bitcoin's price rise came from a value of $0. For clarification, this response is not me defining whether an asset or investment is in a bubble based on whether or not it ever had a starting price of $0. That's what ILikeDividends claimed, but that's not what I meant. To put it more clearly, the key part of that statement that was missed was the "in comparison" portion. In other words, looking at bubbles relative to each other simply based on the prices of the underlying in each given bubble is a complete failure in analysis. A $0 starting point is not a defining characteristic of what makes a bubble or not, that's absolutely true, we're not in disagreement there. But, it makes no sense to compare bubbles simply on the merits of their prices without understanding the underlying forces in the market behind those prices. 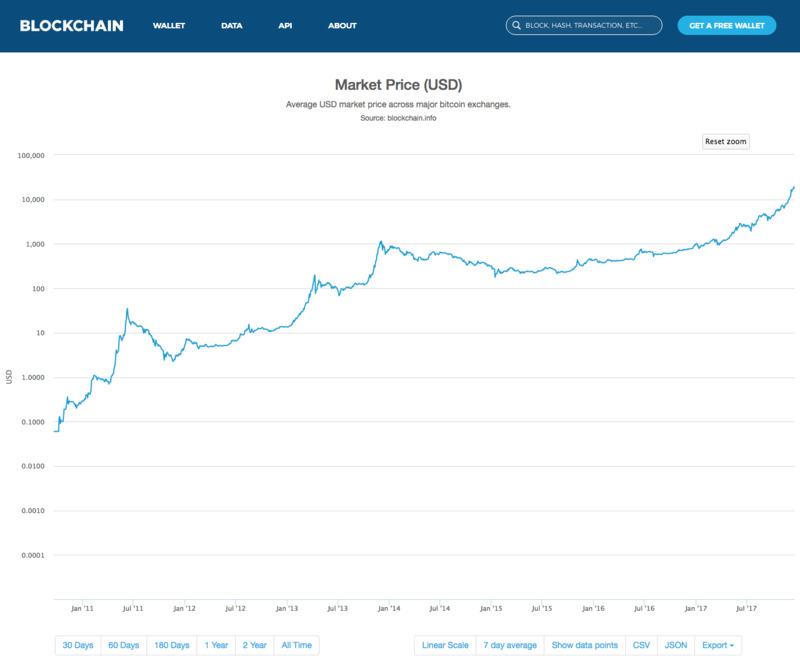 This is why looking at the price of bitcoin on a logarithmic scale is so important. You could've easily taken a snapshot of bitcoin's price at numerous points along the way and it would yield a similar curve to match up to historical bubbles just like the above chart showed. Yet, doing so wouldn't give you any indicator at all as to whether or not you're dealing with a bubble in bitcoin or any other asset for that matter. For example, you could've taken a snapshot starting in Jan 2012 when it had a starting price of $4 and then had "today's" price on that graph be Jan 2014 where it had a price of around $1000. That's a multiplier of 250x and it would've dwarfed every bubble on that chart. In otherwords, this chart skews data historically simply based on arbitrary prices without regard to what determines those prices in the market. I know this was intended as an explanation of how bitcoin isn't in a bubble, but to me it reads as confirmation that bitcoin has never been anything except a bubble. Logarithmic growth by itself isn't necessarily a guarantee that something is in a bubble (although it's a useful indicator), but logarithmic growth for years on end is hard to classify as anything except a bubble. Your argument regarding logarithmic growth feels a lot like someone whipping out a PowerPoint presentation during an evacuation to explain that this isn't an emergency, the building has always been on fire. I know this was intended as an explanation of how bitcoin isn't in a bubble, but to me it reads as confirmation that bitcoin has never been anything except a bubble. Recent article in Wall Street Journal today says that 51 out of 53 economic experts and forecasters surveyed says Bitcoin is a classic bubble. Ugh, we're clearly having separate discussions past each other again. Nevermind. Well, hmm. I thought we already agreed that, if taken too literally, that statement you quoted is nonsensical. If you were referring to that post to illustrate your prior point, well, I'd have to say, yes, I still agree. That was as good an example as any. Maybe I'm missing something more subtle than that? It wouldn't be a first. In the original bitcoin, the way a coin is transferred is taking the prior signature and the next user's public key, and hashing that. Miners saw this data and updated the utxo to the ledger. The original bitcoin was defined as a chain of digital signatures, and accompanying that was a longstanding economic model base on being able to verify the signatures. Segwit removes miners ability to 'witness' the signatures. It changed the economics and weakened the security model. In segwit, signatures have no value; the lack of witnessing a signature can allow malicious miners to redirect transactions to their own address. This, in addition to pruning and increasingly rewarding segwit transactions, creates a situation of new risk. This is not true at all. Saying that signatures have no value with SegWit is completely false. They're still the basis and necessity for being able to spend one's bitcoins. Craig Wright has a history of misinformation (Satoshi Nakamoto ID theft?) and he has always downplayed the role that nodes play in the bitcoin network and overstates the role that miners play in the network. Any node that recognizes SegWit transactions and addresses see the signatures and therefore will validate those transactions and blocks. What Craig Wright is stating in that article would essentially result in a hard fork. It is only the old nodes that wouldn't see the witness data for SegWit transactions, so if a miner were to attempt to spend transactions that didn't meet the rules of the network according to the nodes that recognize SegWit, they'd effectively be performing a hardfork and creating a blockchain that is ignoring the rules of the network that dictate that those coins can't be spent without a valid signature. A miner attempting to mine a block trying to steal coins from SegWit transactions, those blocks would only be recognized by a few old nodes on the network and that block would get quickly orphaned as soon as more legitimate blocks that all the rest of the SegWit nodes recognize get mined. In other words, this is no different of a 51% attack under a SegWit scenario than we would have under a non-SegWit network. This is a similar soft-fork technique that P2SH scripts used when implemented. As we've already seen this year, it has been shown that miners have much less power over the network than they've realized and Craig Wright (the author of your article) has always neglected the power that the nodes and userbase/market have in dictating the direction that the network takes. I don't know the technical side of OMG and how that works, so I can't comment there. I'd have to do some research on it more. Thanks for the info. I'll concede that segwit signatures retain value, but remain firm that the economic model has changed to increased risk, due to segwit. User non-mining nodes cannot validate transactions. Miners are the ones who decide what to validate. User nodes cannot stop what miners validate. If the reward or reason is large enough, and large number of miners collude on malicious behavior, then the chances of a hardfork are very high. What do miners lose, in this situation, and what do they stand to gain? You can't simply assume that it can't happen, or if it happens, that it will not be a big impact, especially when there is a chance of it happening. Segwit changed the economic model and introduced a point of risk. What are you talking about that non-mining nodes cannot validate transactions? Non-mining nodes are the very nodes that validate transactions. Miners don't validate anything. I bolded your statement above because that statement is fundementally not true. Miners perform the proof-of-work to build each of the blocks, but they don't validate those blocks. Only the non-mining nodes that store the blockchain validate whether or not a block that a miner solved is valid. This is the key misunderstanding that Craig Wright and Peter Rizun in his presentation have. We even saw this play out quite vividly this year with several of the hardforks that occurred (Bcash and S2X). Hashpower does not get to dictate what bitcoin is and isn't. A massive number of bitcoin core nodes validate and accept SegWit blocks and transactions and they view all witness data. The market sees bitcoin as having SegWit implemented and so do all the exchanges that are a part of this ecosystem. As we saw with the BCash EDA hassle this year, hashpower had little sway in what the market viewed as being bitcoin. "I'm assuming that the non-mining nodes don't have too much influence over the protocol." Peter Rizun views the bitcoin ecosystem as a closed system from the standpoint of miners and only miners. As we've seen, this is a faulty viewpoint and it isn't how the economical market reacts to what bitcoin is and isn't. If all nodes are validating SegWit blocks with witness data and the market views this as bitcoin and all the exchanges view this as bitcoin and there is massive economic activity that occurs with SegWit transactions, then the miners have very little influence with regard to trying to take over SegWit transactions without witness data. This will only get more and more true as time goes on and more and more economic activity occurs with SegWit transactions that include the witness data. As exchanges like Coinbase and many others make their transition to SegWit, it will become less and less likely that there would ever be an attempt to hard fork away from SegWit. That's essentially what is being argued here...that the miners would make an attempt to hard fork away from a Bitcoin network that uses SegWit and back onto a chain that does not recognize SegWit transactions. The economic model has not changed at all. In fact, it is the economic model (the market determines what Bitcoin is and isn't) that makes this arguement invalid in the first place. What you're essentially arguing is that nodes that don't recognize SegWit transactions that strip witness data will someday be the nodes that determine that Bitcoin no longer utilizes SegWit. In doing so, a hardfork would occur and the market would also need to agree with that fact idea...given the fact that the market would likely have billions of dollars locked up in SegWit addresses, I can assure you that would not happen. Miners can hardfork to their hearts content, we've all seen how well that has worked in the past for them. What are you talking about that non-mining nodes cannot validate transactions? Non-mining nodes are the very nodes that validate transactions. Miners don't validate anything. false. miners validate the entire history of the blockchain (that's the whole point) to decide which blockchain to work on top of, and miners validate all outstanding transactions in the mempool when deciding which transactions to include in a block. Hashpower does not get to dictate what bitcoin is and isn't. false again. hashpower does determine which blockchain is the "concensus" blockchain. again, that's the whole point. hashpower = secure blockchain = bitcoin. Wrong, the decentralized network of non-mining nodes that store a copy of the blockchain is what validates the historical blockchain. The mining nodes simply take a hash of the latest block from those nodes to work on top of for the current block that they're processing. They can certainly choose which transactions to process from the mempool, but if they don't build a valid block that the non-mining nodes agree to, then they will have wasted their hash power. That's the whole point in how the checks and balances work between nodes and miners. If a miner builds an invalid block, that block will not be accepted by the network. That's not really true as we saw and was proven this year. Hashpower is completely economically driven. If the market and ecosystem values bitcoin as being a certain chain and the tokens on the forked chain don't hold any value, then the miners would be operating at a loss under the rules of the forked chain. While they might be able to hold out for a short while, if the market does not get behind that forked chain, then ultimately the miners would need to mine the more profitable chain to stay in business. There is certainly a give and take between the two forces, but it just isn't true that hashpower is what determines what the bitcoin blockchain is. History clearly shows this to be true, so I don't really feel as if I need to argue it. Shadow, the argument you're making against "user" full-nodes is not an argument I ever made. Not once did I ever mention "user" full-nodes or making the case for the ability of users to run full-nodes on Raspberry Pis. There is a big difference between "user" full-nodes and just the idea of full-nodes in general. Essentially if you're a non-mining Bitcoin business, you're going to want to run a full node. As a business, you're not going to want to trust your business to some other third-party that is running a full-node. Secondly, Coinbase, for example, as an Exchange will want to run a full-node to ensure that their transactions are fully validated and that they're also a complete check and balance against the rest of the community. If the only full-nodes out there were miners, then that would mean miners would be able to dictate the business decisions that Coinbase as an exchange were to make. Also, since Coinbase is a business that relies directly on its userbase, Coinbase has a vested interest in listening to that user base to determine what path to follow. This is the key market mechanism that people miss when they place too much emphasis on the power that miners have over Bitcoin. Coinbase isn't in the mining business, but it most assuredly is in the business of making sure that Bitcoin follows the path that the market demands. That is essentially its entire business model and that model depends directly on running a non-mining full-node. The article you linked to and the argument you've made only make sense when talking about "user" full-nodes, but don't make much sense in the context of what I stated above. Finally, if you value decentralization (which the article never mentions), then you must also value non-mining full-nodes. I run cold-storage watch only Electrum SPV wallet. At any given time it is connected to about 10 different servers, many of them are Tor hidden servers, and are very geographically diverse. This is a very critical component when it comes to creating a payment network that is censorship resistant. Bitcoin mining is essentially performing energy market arbitrage by being able to be located in areas with cheap electricity. Because of this, there is a reason why a large chunk of the mining resources are located in China. I mine with an ASIC at my house and use the Slushpool mining pool since it gives me a vote as to which Bitcoin version I mine for. Since most mining takes place in pools, if only miners were the ones running full-nodes, then my SPV wallet would not be making nearly as many diverse connections around the globe. This is very bad for decentralization and censorship resistance. Large numbers of geographically diverse full-nodes provides a proper check against mining, especially when that mining is not nearly as geographically diverse. I agree that Bitcoin without mining is not Bitcoin, but if you put too much emphasis on the power that mining has over the network, then I'd absolutely argue that Bitcoin without a large number of geographically diverse full-nodes is not Bitcoin either. The mining nodes simply take a hash of the latest block from those nodes to work on top of for the current block that they're processing. sorry but there's no point in continuing this discussion in this thread. you've obviously been misinformed. mining nodes don't have to take a block hash from non-mining nodes. miners can ignore new blocks coming in from the network and create their own chain in secret, then broadcast this secret chain later once they have the most cumulative proof of work. that's how a "51%" attack works. They can certainly choose which transactions to process from the mempool, but if they don't build a valid block that the non-mining nodes agree to, then they will have wasted their hash power. that's all they do. there's no other way for transactions end up in a block. if the majority of miners are working on a chain a node doesn't consider valid, and the node wants to follow a different chain, then the node has to follow some other consensus rules. the node would then not be a "bitcoin" node. in fact this is exactly how the bitcoin forks work. That's not really true as we saw and was proven this year. History clearly shows this to be true, so I don't really feel as if I need to argue it. i don't know what you're talking about. no other chain has ever had the most cumulative proof of work. My statements don't disagree with this. Businesses that accept btc will want to run nonmining fullnodes. Enthusiasts and researchers may want to run a nonmining fullnode. I agree. I was a little confused then that you linked to an article that was literally titled: "Why non-mining full nodes are a terrible idea." and you claimed that Bitcoin = miners. If you agree that non-mining full-nodes are a critical component of the Bitcoin network, then we can agree there, but it didn't seem as if your post was arguing for that at all. The thing about decentralization in a proof-of-work, is that it faces unsustainability and other risks. Every performance tweak, every optimization, every competitive advantage, every newer model of of asic, creates a situation where miners must adapt similiar enhancements to compete. Factor in areas where you get cheap electricity. Miners are ok as long as they operate in the black, but if they can't keep up with costs (higher and higher costs, or btc value doesn't keep pace with costs), they have to shutdown part of the mining operation or they may even entirely have to give it up. The problem with this is that it affects usability. The crucial aspect impacted is infrastructure. The people who believe concentrated pools of miners are ok, given the factors of increasing efficiency that will phase out smaller miners, also believe that decentralization naturally results from a higher blocksize limit, which increases usability. Businesses are the ones who must at least run nonmining fullnodes because they process customer transactions. So greater usability --> more users --> more businesses. Now, you have 1000 users, 10 miners or even more (systems that rent mining power to normal users increase), and 90 businesses that run nonmining fullnodes. The percentage of nonmining fullnodes are lower than in the limited blocksize scenario (10% vs 90%), but that does not make it more centralized then the other scenario. It seems to a be question of perspective: which situation would actually better defend against centralization? It seems like you operate with a very black and white perspective. Since hashrate within mining pools can be fairly dispersed, I don't feel there is a need to have a large number of mining pools, so long as the hashrate within them is fairly decentralized. So long as you have enough mining pools to cover the varying degrees of consesus, then you can withstand various attacks and censorship. Since mining pools are more abstract and application layer entities, it is very hard to censor a mining pool itself even if there are only a few of them. Having a geographically decentralized and disperse group of non-mining full nodes however is even more important since often these groups of nodes need to talk the Bitcoin protocol across the internet and often are businesses themselves that depend on these nodes to run their business. Since these business operate within the jurisdiction of any given nation, it would be much easier to censor non-mining full-nodes than it would be to censor any given mining pool of diverse miners. As I stated earlier, it is this large group of decentralized and geographically disperse non-mining full-nodes that provide a proper check against the mining infrastructure. Again, I'm not for or against a bigger blocksize at some point. It will need to be an inevitable change to be made to the protocol in order to scale it even with adequate side chain solutions in place. But, I feel like you're straying from the original argument and trying to now squeeze a blocksize debate into the picture where there was none previously. Aside from acknowledging that blocksize increases are not a valid form of scaling exponentially (which is needed for large scale adoption), then I understand the need for blocksizes that are larger than the current restriction today. However, our original argument was in regard to whether mining is the central form of power within the Bitcoin network and ecosystem and whether or not SegWit introduces security flaws. As I've stated, unless you feel that miners are the sole dictators of Bitcoin, then SegWit does not introduce any more security issues than were already present with the risk of a 51% attack or a contentious hardfork driven by miners. I stand by my position on the fact that non-mining full-nodes are a check and balance against miners and even though you've now strayed into a separate debate altogether (block-size), I haven't heard a valid argument against having that check and balance in place. That check and balance provides security and will ensure that SegWit is a secure part of Bitcoin going forward that can't simply be contentiously removed one day by a malicious group of miners, no matter how strong they think they are. But they still need to choose a valid block height to operate from as a point of fork. That was my point. They obviously don't need to pull that block from a non-mining node, but that misses the point that they'd certainly need to pull that block from a legitimate chain (whether their own copy or not) in order to present their fork chain for consensus. Otherwise what would be the point of forking? I'm not up for arguing semantics, so please don't underline my sentence and claim like I was stating anything other than what was clearly typed out. We're in full agreement with how transactions end up in a block. I agree we haven't. But that's certainly not without an effort to have one, as was shown with the proposed SegWit2X fork. That was a proposed hardfork that had a majority of hashrate behind it. Had it gone through, it would have been the most cumulative proof of work chain. However, due to the lack of support from the community, the number of non-mining full-nodes in opposition, and the lack of ecosystem support (exchanges, payment operators, etc), then the fork didn't go through (not taking into account that the code itself was screwed up). Recently we sold most of ours. WE decided a bird in the hand is better and just kept a few in case it goes up even more. Come on, it only needs to double about 15 more times before everyone holding at least 1 BTC is a USD billionaire. At this surely sustainable growth rate that should happen by this time next year. How do people feel about coinbase adding BCH? Damn! In August when my best friend tried to get me to buy bitcoin it was $3k and I thought that was too high to buy in. He thought $10k was the ceiling and it would take a year. yeah. To be fair, with zero intrinsic value the PE ratio (or whatever) is no worse at $20k than at $2k.. There is no PE ratio because E=0. Exactly. Just like intrinsic value, and potential value, or future earnings, or spending power, etc etc. Math is easy when it's all zero! open competition between BTC and BCH is good. the actual announcement and start of trading didn't go well, but i don't think that will matter either way in the long run. my guess is all the people that tried to make a quick buck and sold all their BCH early now regret it because of the current price of BCH. if BCH drops to zero they'll be vindicated but i don't think that's likely. There's a difference between calling a bubble and calling a top. You can be in a bubble for years. The original premise was that bitcoin would have use-cases that would compel people to acquire it to use; and this would therefore escalate demand and value. However, rising use-cases and transactions have shifted to newer, superior crypto. My prediction is that by 2019, bitcoin's market dominance will dip below 50% (it's currently 62.4% and one year ago it was 86%). There will be crypto that will outperform bitcoin; and a few of these crypto have the potential for a huge breakout due to true onchain scalability, mass adoption, and compelling use-cases (superior remittance system, access to online financial services, a platform that allows payment networks to instantly settle and various units of value to be traded with each other, etc). I recall reading something about how a bank (or some financial institution) was trialling cryptocurrency. One of the team mates was totally into Bitcoin and had personally invested into it but after performing the rigourous tests he decided that it was a bad investment as it takes hours to transact. I didn't know about the dip in market dominance but I'm also not surprised. That's why I think Dash, Ripple, and other similar crypto will win the day. The only thing is I don't think Dash and Ripple are seriously considered a digital currency as opposed to Bitcoin. Ethereum might win as well but I have heard they are having some serious problems as well. I'm not too sure about Litecoin though as I'm not sure what its use cases are. Just in time for me to buy the Carolina Panthers with my bitcoin billions! It really is the dot-com bust all over again. I just read that too. What's a good name for the impending bust? The dotcom era led to the dotbomb. The bitcoin era has a...bitless crash? WTF? That's not real is it? Pivoting from iced tea to blockchain.. something? Whaa?? And to be fair to the dot-com boom those companies at least had the potential to make money. Pets.com could have been profitable, at some point. BTC can...eh, function as a highly volatile middle-man to buy starbucks, which is instantly converted to USD. Sure. These are economic experts, not kindergardeners. here's The Economist in October 2011, with the price around $3: "BITCOIN, briefly the world's favorite cryptocurrency, is in trouble." here's CNN Money in April 2013, with the price around $80: "Bitcoin bubble may have burst"
here's The Economist again in November 2013, with the price around $1000: "the recent price surge, driven by Chinese investors stashing money offshore, looks like a classic bubble." and again in May 2015, with the price near $225: "Six-and-a-half years on, the bankers may feel they can relax a little. Interest in bitcoin has waned." here's The Wall Street Journal in June 2017, with the price near $3000: "Bitcoin [...] roughly tripled this year. 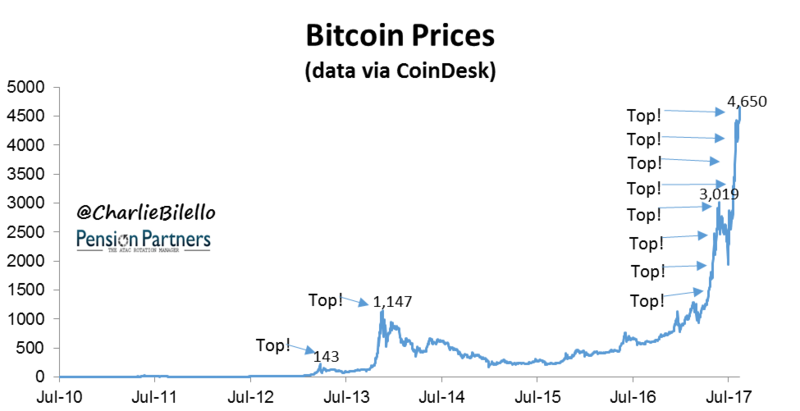 Given bitcoin’s history of volatility, a tumble at some point seems inevitable." I didn't post that graph to say whether it is true that we are in a bubble or not, nor whether it would be prudent to invest in Bitcoin or not, but rather about the fallacy of making predictions without hindsight, especially if you were going to act on them (no shorting is available that I know of). It's a bit of a semantics argument, but I'm not sure one can call a bubble until it is popped. It has to be done with hindsight. I didn't post that graph to say whether it is true that we are in a bubble or not, nor whether it would be prudent to invest in Bitcoin or not, but rather about the fallacy of making predictions without foresight, especially if you were going to act on them (no shorting is available that I know of). Call me a sematics geek, but it's a bubble. It can continue to be a bubble for another 10 years, but it's a bubble, nevertheless. Hopefully, many can make fortunes before the bubble bursts. But it will burst. I don't intend to be there when it does, and I won't regret the potential billions I could have made in the mean time. There is potentially functional value with this technology, but there is no economic value. At some point, the functional value of this technology will be exploited. But it will not be in the form of a currency. The company that can exploit that will be the next Google, but they are not on the investment horizon yet. Right now, there are penny stock Tea companies (who actually just sell tea) changing their names to "block chain Tea," and realizing a 1,000% appreciation in share price in mere days (less than a week), simply because of a name change. That's a bubble, my friend, no matter how you want to slice it, semantically. And, unlike BCOs, they fall under the regulatory purview of the SEC. ^ It really is the dot-com bust all over again. Well 51 out of 53 were right. Down more than 50% off it's high.